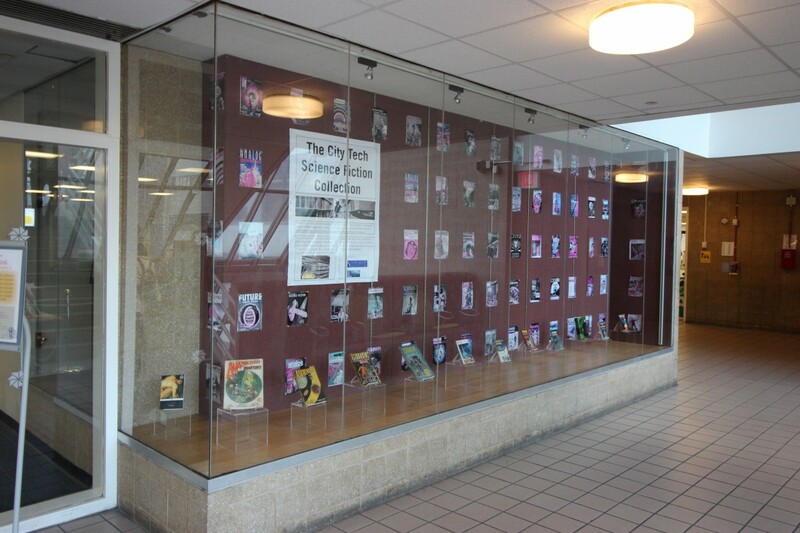 Prof. Jason W. Ellis installed three window displays in the entrance to City Tech’s Ursula C. Schwerin Library, where the City Tech Science Fiction Collection is housed. 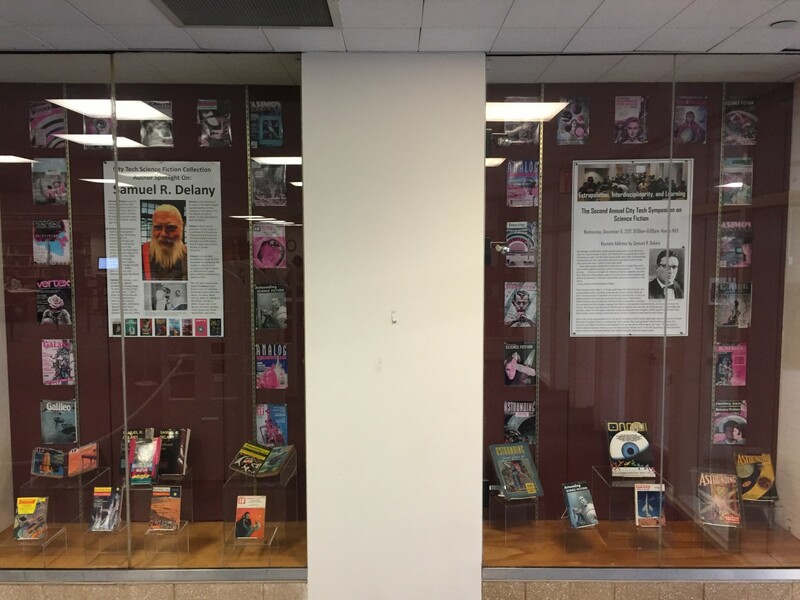 When entering the library, on the right are two displays: the first is on the upcoming 2nd Annual City Tech Science Fiction Symposium on Extrapolation, Interdisciplinarity, and Learning, and the second is an Author Spotlight on Samuel R. Delany, this year’s keynote speaker for the symposium. 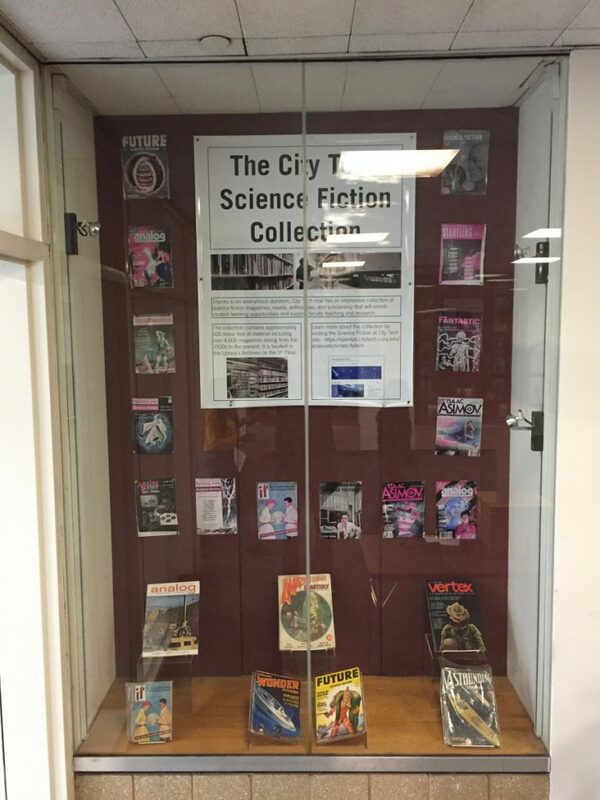 On the left side, adjacent to the circulation desk, is a display on the City Tech Science Fiction Symposium. In addition to designing posters for these displays and showing magazine covers from the collection, each exhibit has artifacts from the collection. Samuel R. Delany’s exhibit features magazines in which his fiction appears. These exhibits will be up until January 2018. 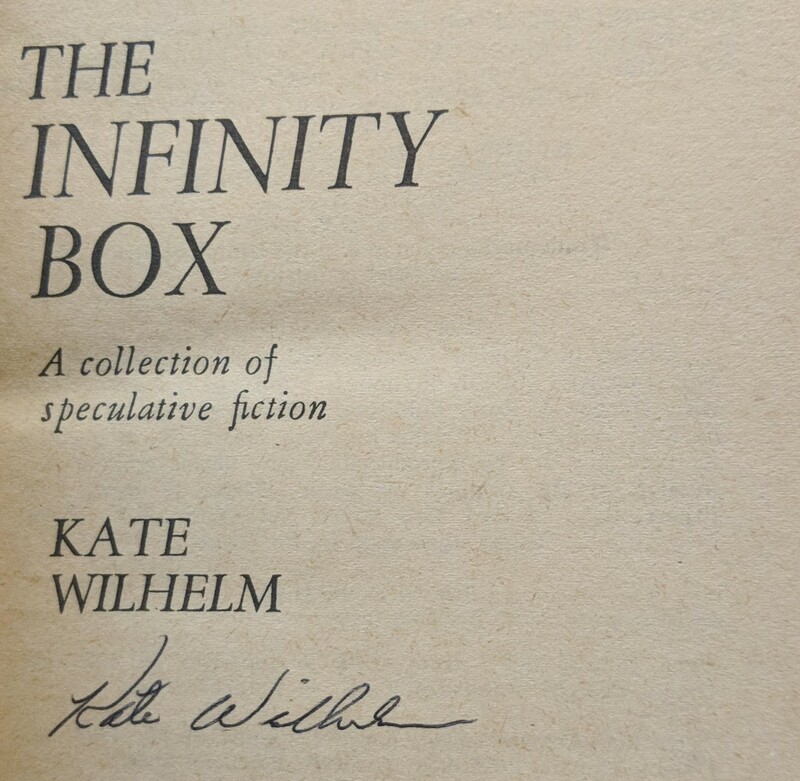 This entry was posted in science-fiction-collection, symposia and conferences and tagged collection, delany, exhibit, library, samuelrdelany on November 14, 2017 by Jason W. Ellis. Prof. Jason Ellis installed a magazine cover and science fiction artifact exhibit in the front window space of the City Tech Library. He took photos of magazine covers that related to the historical and current work represented by the schools and departments on campus. Then, he compiled these into large collages (standardizing each cover to be 9.5″ tall), which Dean of the School of Arts and Sciences Justin Vazquez-Poritz had printed. Prof. Ellis cut the magazine covers out of the collages, and with the help of masonry guide lines, hung nearly 70 magazine cover prints on the exhibit space wall with pushpins. He created the large poster to the left side of the exhibit to describe the collection. 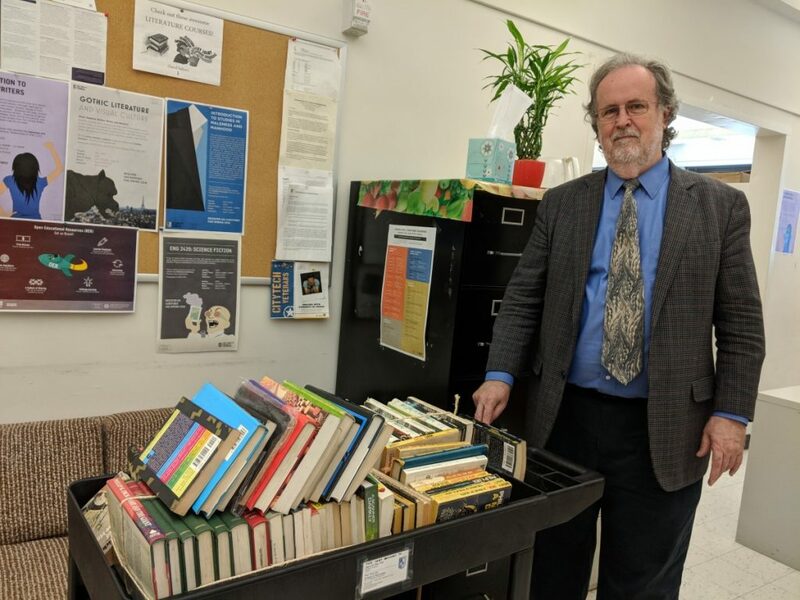 In the front of the exhibit space, Prof. Ellis displayed a historical selection of artifacts–magazines from the collection (Amazing Stories, Astounding, Galaxy, and The Magazine of Fantasy and Science Fiction) and novels/collections from his personal collection (Shelley’s Frankenstein, Ellison’s Dangerous Visions, Sargent’s Women of Wonder, and Sterling’s Mirrorshades). The exhibit will run from the last week of November 2016 until the end of the semester. This entry was posted in science-fiction-collection and tagged collection, display, library, magazines, window on December 3, 2016 by Jason W. Ellis.